My stockbroker friend got a phone call from a hysterical client on Christmas Eve. She was panicking over all the money she had lost in the market—and demanded to sell her whole stock portfolio. As you know, December was horrendous for US markets. The S&P fell 10%. It was its worst December since 1931 during the Great Depression. In fact, it was the S&P’s worst month overall since February 2009. From 2009 to 2017, US stocks posted a gain every single year. That nine-year winning streak is now over. The S&P closed out 2018 with a 6% loss. If we are in a bear market, there’s likely more downside from here. In the 10 bear markets since the 1920s, stocks fell an average of 32% from their highs. The S&P has already fallen 17% since peaking in September 2018. If we’re in for an “average” bear market, stocks should continue falling. And I’ve heard from a lot of my readers who are nervous stocks are headed for a full-blown crash. For those new to my content, I’m part of the RiskHedge team, a disruption research service that finds early-stage disruptive stocks. Think of Amazon or Apple back in the early 2000s. So in the rest of this article, I’ll look at how “disruptor stocks” perform in a worst-case scenario… like when US markets cratered 57% during the 2008 financial crisis. “Disruptor stocks” are companies that create, transform, and disrupt whole industries. For example, today I see cybersecurity and 5G as some of the most disruptive sectors. Buy a disruptor early on, before it becomes a household name, and you’ll often stand to make profits of 1,000% or greater. Even better, as you’ll soon learn, disruptor stocks often thrive in bear markets. It’s a good addition to your portfolio as markets turn volatile. Take Priceline (BKNG) for an example. Remember when you had to talk to a travel agent to book a vacation? Now you can book a whole trip from your computer in under ten minutes. Priceline was the main driving force behind this disruption. Its online booking platform dominates the $240 billion global travel services industry. Close to half of all vacations booked online today are booked through Priceline’s network of websites. Back in 2007, just before the financial crisis, Priceline was still a small firm with just $140 million in sales. In the next two years—2008 and 2009—its earnings surged 249%. During the darkest days of the worst financial crisis since the Great Depression, Priceline’s business didn’t just hold up... It grew faster than ever. A few months ago, I talked about a super-profitable business called the cloud. 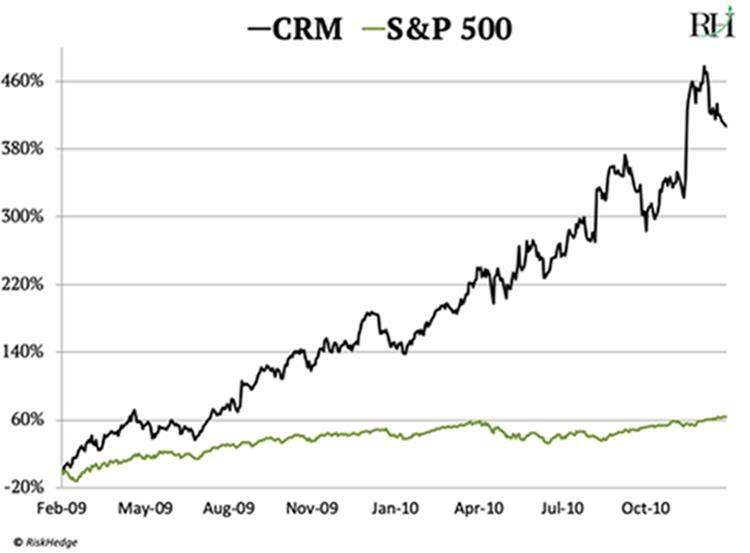 Salesforce.com (CRM) pioneered this business two decades ago. Today over 150,000 clients pay Salesforce a monthly fee to use its customer relationship management tools. Investors who got into Salesforce stock early booked profits up to 1,750%. Like Priceline, Salesforce’s profit and revenue growth rode right through 2008 and 2009. During this period the average S&P 500 company’s earnings tanked 77%. Salesforce’s earnings, meanwhile, more than doubled. Look at the chart below. You’ll see that after markets hit a bottom in 2009, Salesforce stock rocketed six times higher than the S&P by the end of 2010. Iconic American stocks like Lehman Brothers, Bear Stearns, and Merrill Lynch couldn’t survive 2008. How did these disruptors do it? 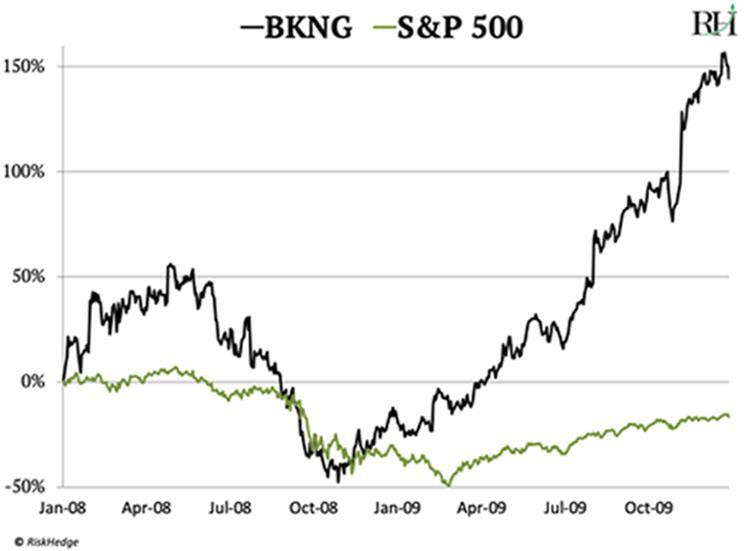 It comes down to the difference between a business and a stock price. In the short run, emotional buyers and sellers push stock prices around. When fear grips markets, stock prices go haywire. But ultimately, business performance is what matters. True disruptor stocks have a rare quality: they grow… and grow… and grow… no matter what the broad markets are doing. As such, their profit engines kept running right through the 2008–2009 meltdown. Priceline’s earnings surged 249% during the financial crisis. Salesforce’s more than doubled. Earnings for another disruptor, Amazon (AMZN), shot up 89%. To put this in perspective, say you had invested 10,000 bucks each in Priceline, Salesforce, and Amazon at the beginning of 2008. By the end of 2009, your stake would’ve grown to $54,000. Compare that to an investment in broad markets. If you’d bought the S&P 500 on January 1, 2008, you wouldn’t have recouped your losses until March 2012. Your investment would have been dead money for over four years. Look, I doubt we’re headed for a crushing bear market like 2008. Huge crashes like that just don’t occur often. But if we are headed for stormy markets, I want to own disruptor stocks that will power right through it.